This article will walk you through the process of removing an accommodation type from your platform. Only users with the hotel setup permission will be able to remove accommodation types. Deleting a room type is not recommended and can cause serious issues. The reservations assigned to this room type must be re-assigned. Their rates will not be updated to reflect the price of the new room type. You will want to ensure that all OTA's that you work with are informed that you are removing that particular room type from your property and to remove listing. This will eliminate any future bookings in that particular accommodation type. "Warning: You are removing room type (Name). If your connection to myallocator is active, this will likewise close out availability and remove room type on myallocator. Are you sure you want to continue?" Once you save, a warning disclaimer will appear. It is imperative that you read the disclaimer before proceeding further. Before you are able to delete the accommodation type, you will need to re-assign any reservations that have booked that room type (if there were any). After the reservations are re-assigned to the new room types - their rates will not be updated to reflect the price of the new room type. 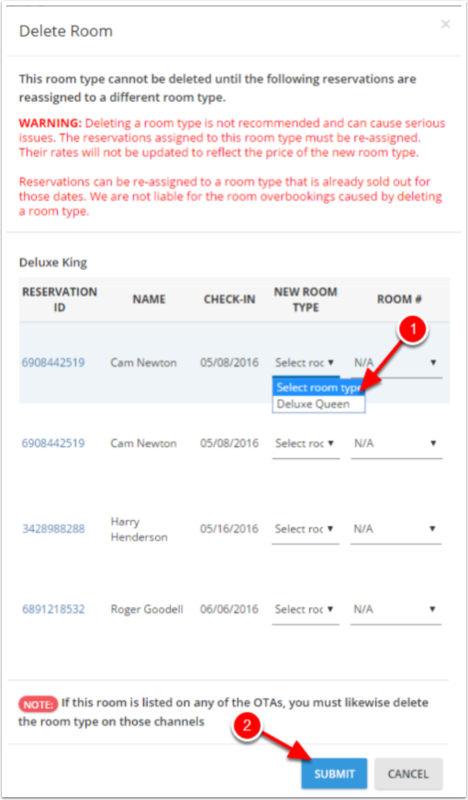 Reservations can be re-assigned to a room type that is already sold out for those dates. We are not liable for any room overbookings caused by deleting a room type. 1. Go through the table and assign each reservation to the new room type. When re-assigning reservations please note that you do not necessarily need to assign a particular individual room, although assigning to the new ROOM TYPE is Mandatory. 2. Click submit at the end of the list to complete the process.